Imagine you’re out at lunch with a friend and you get a notification on your phone saying, “Your payment is being processed” — but you didn’t buy anything online. You check who sent the email, and it says support@amazon.newuser.com. Looks kinda legit, right? But there’s more going on than what you might notice on first glance. What you’re experiencing is known as phishing. Here are a few tips to help you easily spot phishing and hacking attempts. And also, guide you through what to do if you receive a suspicious email. How can you spot a phishing scam? Getting an email with a subject line telling you that your payment was successful when you haven’t purchased anything recently is something that would jar any of us. That’s exactly what a scammer’s goal is – to cause you to panic. Have you ever received an email that looked like it came from a company you do business with, only to open it and find that the message seems off? You’re not alone – which is why it’s important to double-check the sender’s email address. Using fake email addresses that closely resemble the real source’s is a favorite move of scammers and one that’s easy to overlook. An email address is made up of two parts: a username, which comes before the @ symbol, and a domain, which comes after it. Scammers like to make subtle changes to the domain to hide where an email is coming from. This means that the difference between a real and a fake email could be as simple as support@newuser.microsoft.com (real) and support@microsoft.newuser.com (fake). You can tell the first email address is really from Microsoft because the company name is the last part of the domain. The second email is from another source because the word “newuser” comes at the end. It’s highly unlikely for a company to ask you to give out personal information like usernames, passwords, or credit card numbers. In some cases, a scammer’s goal may be to convince you to click a link and enter your password into a fake, look-a-like site they’ve built. In this case, they may try to spoof a legitimate email address. Remember — you can always hover your mouse over the link, and it’ll show you where the link is attempting to take you. Established companies often have entire departments dedicated to proofreading emails, so lots of incorrect punctuation, grammar, or spelling should be a red flag. Scammers will occasionally attach files to their emails, hoping you’ll download them. These attachments can infect your device with malicious software or steal your information. 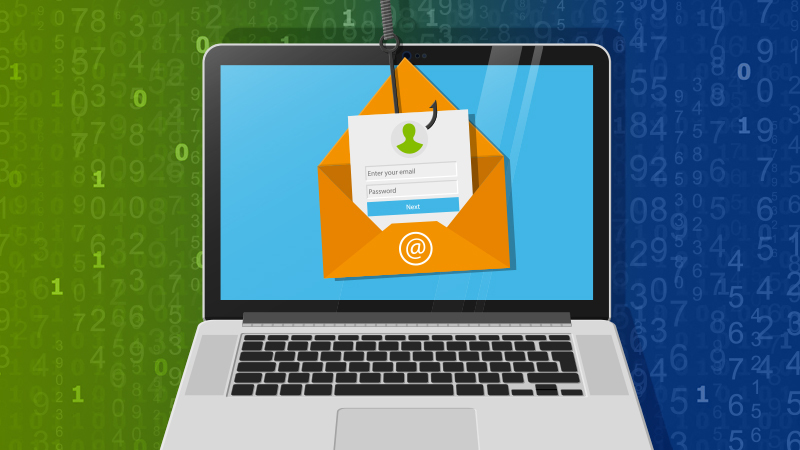 Once you know the common phishing tactics, it’s easier to keep your data safe. You can help others by reporting phishing attempts to the United States Computer Emergency Readiness Team, which will add them to a list of known scammers.